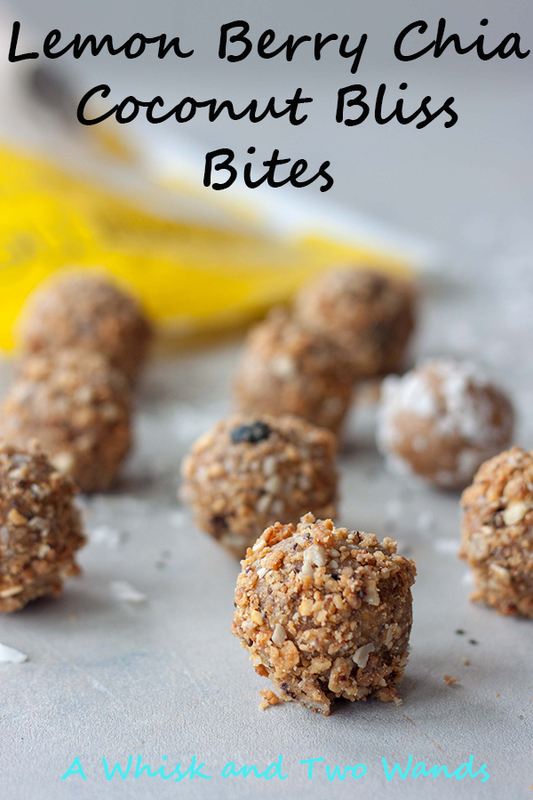 It’s Friday and I’m finally feeling like things are getting back to normal here after being gone so I’m going to brighten things up with a little sunshine (ok maybe not because Mother Nature is doing her own thing right now and not listening) and Lemon Berry Chia Coconut Bliss Bites! So much to do but when I was scrolling Instagram while sitting waiting for A to finish up at gymnastics I came across Almond Coconut Bliss Bites Whole Me posted. I instantly knew I had to whip some up, they looked too good and too easy not to. Plus I love Whole Me, a locally (woman) owned company I’ve loved for years before becoming an ambassador last year. This isn’t a sponsored post, I help with local events when I can and would be sharing my love for them regardless. I do get a 20% discount when ordering from their website but I get to share that with any and everyone (no commission on my end), code is MISSWHISK20. Usually I just end up picking them up locally though instead of ordering. Anyways back to my version of these bites just wanted to be transparent. The hardest thing for me was deciding between my 2 favorite flavors Lemon Berry Chia and Salted Peanut Chocolate. It’s officially spring so I went with Lemon Berry Chia and made Lemon Berry Chia Coconut Bliss Bites! They’re like fresh little bites of citrus kissed sunshine! To be real I made a batch with Salted Peanut Chocolate too but will share that on IG Stories later. The laundry can wait, besides today is my husband and my wedding anniversary and I’m hoping this is the year I get that laundry fairy or a maid. Kidding of course. These are so easy I could whip them up while waiting on dinner, making breakfast, or working on something else. That’s just what I did and I don’t think they took me 15 minutes. Plus only 5 ingredients that I already have on hand, dates, oats, unsweetened shredded coconut, coconut butter (if you have unsweetened shredded coconut you basically have coconut butter since that’s all you need), and Lemon Berry Chia Whole Me Clusters. Yes another reason to make coconut butter if you haven’t already, warning you will be hooked on how easy and delicious it is! 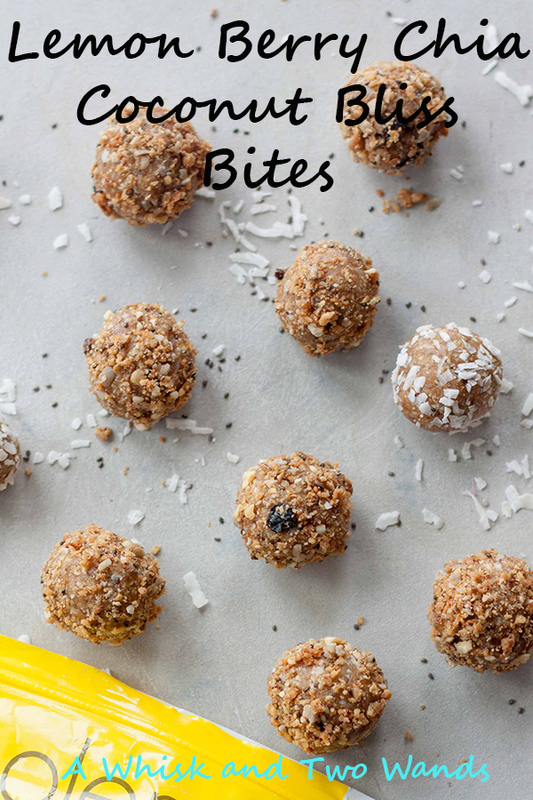 These delicious little bites are gluten free, dairy free, and vegetarian. Not vegan because the clusters are made with honey, the clusters are paleo but as I used oats in these bites they are not paleo. 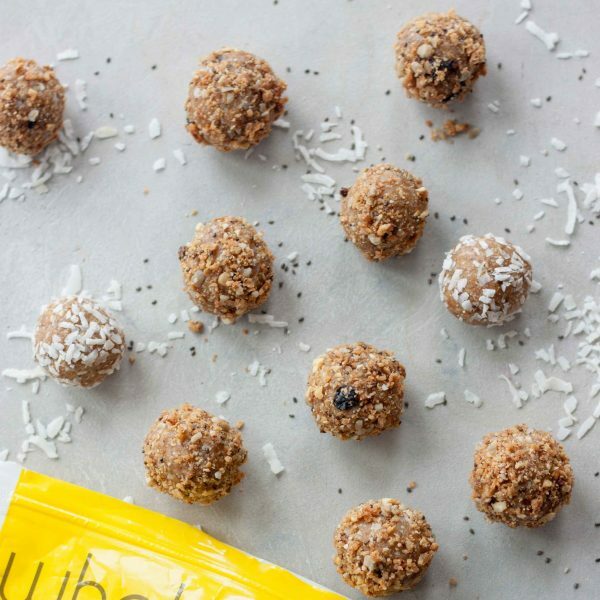 These nutrient dense snacks are packed with dates they provide energy and satisfying healthy fats from coconut, cashews, and chia seeds they make a great snack! I’m planning on having a couple with a matcha latte this morning before barre since I’ll already have had my coffee because I have to get up early to make sourdough and a cake. I’m kind of obsessed with coconut lately and these are something quick and easy I could make for Easter weekend. My dad and I really like date bars and these didn’t have as much of a date taste but the texture reminded me of them and they are definitely made with dates. 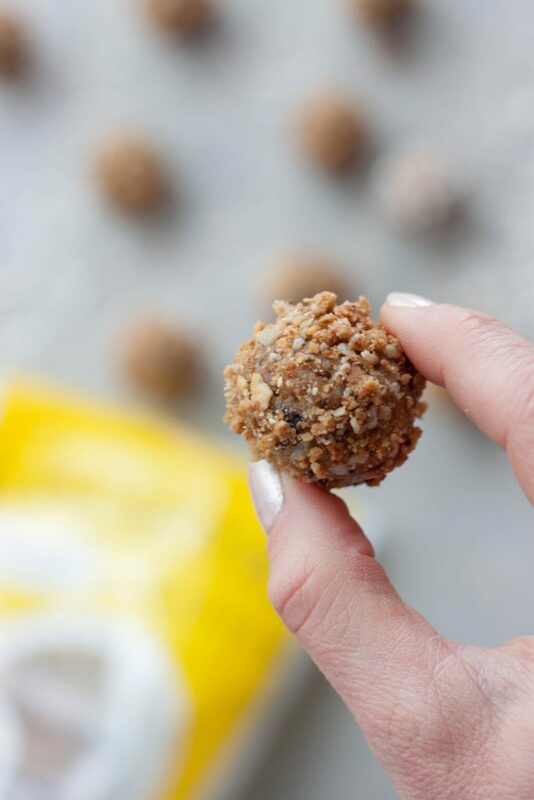 My aunt also loves the Lemon Berry Chia Whole Me Clusters and date bars so I know she’ll love and appreciate these Lemon Berry Chia Coconut Bliss Bites! Since I don’t think I’ll have time to whip up a carrot cake next weekend thought I could make these ahead and they would be a healthier option. Next week we have a busy week which is also why I decided to whip these up. We have the usual soccer, gymnastics, and dance along with S having her first communion, Good Friday, and then heading right up to my parents. The two things I committed to for Easter was salad and sourdough since Easter Sunday also happens to be National Sourdough Bread Day, oh and April Fools but it’s no joke it really is National Sourdough Bread Day. I always bring treats though, not that we will need them, so the girls can whip up No Bake Bird Nest Cookies for their cousins and for one Easter, I can whip up these for my dad, and we might make one other thing that’s quick and easy. I always take on a lot but I like to spend time in the kitchen so not going to lie if I get time up at my parents I might relax watching Food Network while also standing in the kitchen whipping up a carrot cake if my husband has the bread under control. I haven’t been posting on Friday’s lately but since these were so quick and easy I thought they’d be perfect to share today so I snapped a few pics and I’m sitting here writing away at A’s dance. Plus I can see playing around with more flavors (besides the Salted Peanut Butter Chocolate I already did) and it wouldn’t get lost just posting on Instagram. Oh and a great way to share my discount code for Whole Me (MISSWHISK20) for those who want to try them and share a little more since as I said it’s a local company I love and they shared some new things at Expo. If you follow me on Instagram you already know I’m obsessed with their clusters, or as A calls them chunkies and I have no idea why she calls them that. They use to be big clusters of granola that I used for sprinkling on smoothie bowls, oats, chia pudding pretty much anything or making into bars or bake into things which if you browse on the blog you’ll see some recipes over the years. They recently changed to bigger chunks that are like 1/4 or 1/3 the size of a regular granola bar or protein bar. This means I have to crumble them for sprinkling now but also means that we can just grab a chunk when we want a small snack but not a full bar. They are also coming out with bars by the end of the year which they had at Expo but not ready to try yet so I can’t tell you how they are. They also debuted 2 new flavors at Expo, Apple Chai and Honey Espresso. Super excited to try the Espresso, because umm hello I LOVE coffee. I did try the Apple Chai and I like apple and chai but it wasn’t love at first bite, but I’ll give it another try when there isn’t so much going on. 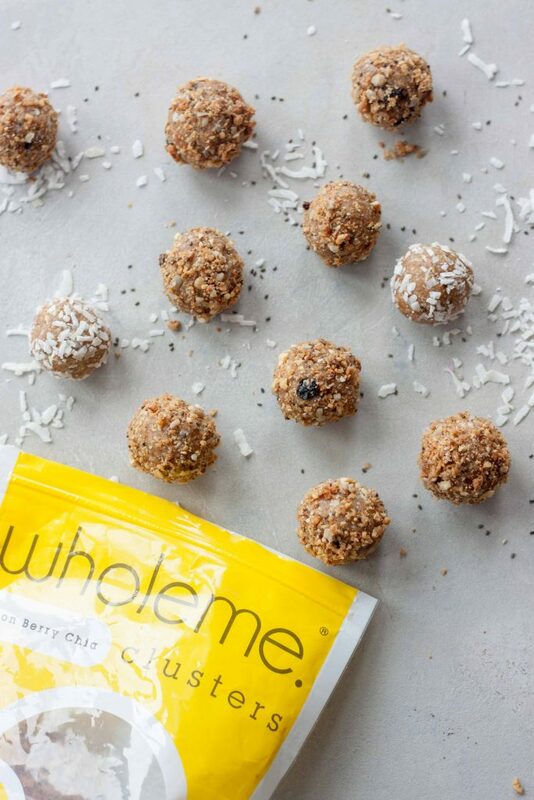 Whole Me also announced that they are rolling into Costco stores with bigger bags. I have little characters in my head debating this one, oh yes bigger bags that means more, and on the other hand ummm hello you already have no self control with a bag do you really need a bigger bag? Kind of like other Costco items like popcorn that clearly I don’t need more of but with the bigger sizes… yeah you know I know I can’t be the only one. I debated on sharing an Expo recap on the blog but decided to share new finds on Instagram Stories and on here when I have a recipe with them. I will also probably be doing a couple more reviews over on GoDairyFree.org. I recently shared reviews for GoMacro Bars, Delighted By Dessert Hummus, and REBBL Elixirs and REBBL Protein Drinks. If there are others you want to see here, or certain products (ie dairy free yogurts, cheeses, new plant-based proteins, bars, superfoods) let me know in the comments below, send me a message, or message me on Instagram or Facebook. I did take S with me for a day and there are things she loved I didn’t and vice versa, she found some new dairy free cheese sticks (which I don’t think I would ever buy for myself), ice creams, and a few other things. There are a lot of new flavors from brands I love that I hope to get my hands on locally first before I share so I know they are in stores and you aren’t like me out looking for things that aren’t there yet. 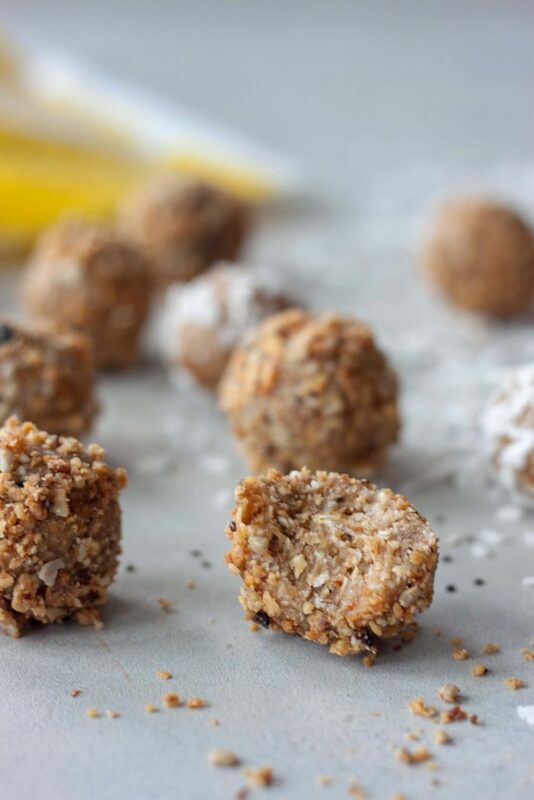 Quick and easy Lemon Berry Chia Coconut Bliss Bites made with only 5 ingredients! 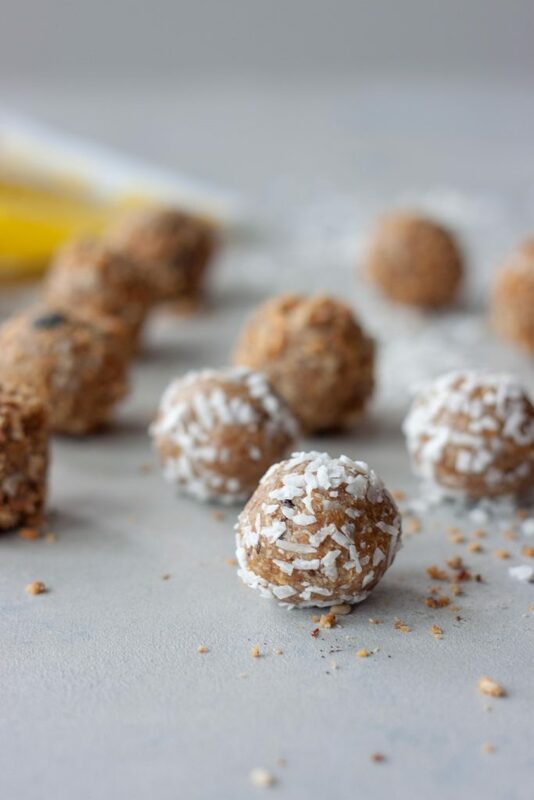 These delicious gluten free, dairy free bites are perfect for a quick snack and provide quick energy with dates but healthy fats make them satisfying and filling! While the dates are soaking if you want to roll your bites in cluster crumbs or coconut pulse 2-3 (I used 3 and had extras for my smoothie bowl) clusters into crumbs or about 1/4c of coconut into smaller pieces. Place crumbles on a plate or small dish. Drain water from dates, remove pits, and pulse the dates in a food processor until you have small pieces or a paste (since that might happen quick depending on the freshness of your dates). Add the rest of the ingredients and pulse until well combine and mixture comes together. Roll into small balls, about 16, and roll into optional crumbles or coconut or just place on a plate. Store in the fridge or freezer, or enjoy right away! These are perfect right out of the fridge, no need to soften. To make your own coconut butter just blend an 8oz bag of unsweetened shredded coconut in a food processor or Vitamix, in a Vitamix it takes maybe 5 minutes, food processor it takes longer I've heard about 10-12 minutes and you'll want to stop and scrap down the sides from time to time. Store in glass jar with a tight lid on the counter, if the temp is above 70 or so it will remain soft otherwise it will get hard and you will have to warm it up. This is basic coconut butter from hear you can add sweetener or play with flavors if desired. Happy Anniversary, hope you get that laundry fairy. lol Have a great weekend! These look amazing, i have been on a coconut kick lately. I am not a huge fan of coconut but want to be (Im not sure why) So I have been using it in everything. You always have such great recipes! These sound delicious! I love no-bake bites. These look so good and easy to make. I might just have to try some of the Whole Me products. Thanks for sharing. I love anything lemony lately. Actually Spring calls for lemony treats, right?! I love these balls. WHat a great snack idea. So healthy and delicious. Yum! These sounds so good! I love the combo of flavors and how quick and easy they are to make! !